At this time of year, you have to search for beauty in your garden. Under little pockets of leaves or flopped masses of foliage, you can often discover colorful moments. I must admit, there are certain plants I love because of low maintenance. Roses don’t typically fall into that category. Lots of insects and diseases love roses. With such fierce competition from nature, roses are often one of those plants you say, “Never mind.” But we always make room for exceptions. We position roses as accent pieces; individually planted and strategically located within our borders. Each rose in our garden is chosen for exceptional color and impact. 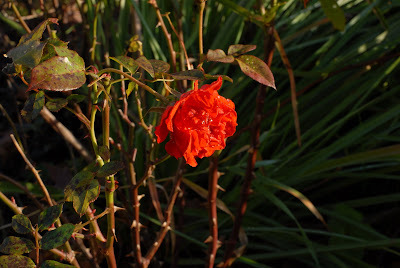 If the rose is taken out by some pest or disease, it doesn’t tend to offset the composition. Another more reliable plant can easily replace the rose. The rule of thumb when planting any delicate, sensitive, marginally hardy or susceptible plant; use only one specimen and position it strategically for impact. This year when we were buzzing around Russell’s Garden Center, the Rose ‘Light My Fire’ by Jackson & Perkins™ stood out amongst a myriad of container roses. With over 150 various selections to choose from, this rose’s brilliant color and dark foliage caught my attention. It went in the cart despite any cultural questions. It was love at first sight.